Property Size 1,914 sq. ft. 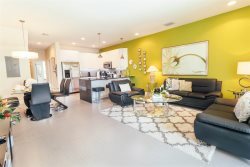 This townhome was designed by one of the top builders in the Orlando area. Guests will be able to enjoy all the modern amenities one expects in a luxury vacation rental. Top of the line furnishings and beautiful décor offer an inviting experience for your vacation. The kitchen will delight the chef in your group. It features stainless steel appliances, granite countertops, updated cabinetry, and all the hardware needed to prepare the perfect meal for your family. The Juliet House has a private pool and is the perfect place for your next Florida getaway. Just minutes from Walt Disney World, Universal Studios, Volcano Bay, ESPN Sports Complex, Orlando Eye, International Drive, Fun Spot, Sea World, The Florida Hospital, golf courses and much much more. We had a great experience in this place. The location is great and everything was closed to us. The house was so clean and organized as expected.My family and I were so pleased and we spend a great time. Very nice, decorated, complete house. Many restaurants nearby and minutes to Theme parks. We recommend this place for family vacations. The house was beautiful. Nicely decorated and made us feel at home. Carolina Carreiro Reservations: One word for her awesome, just like our stay. Awesome! Club House, lazy river, spa, ice cream, spa, pool and bar. Makes you not want to leave the property. Loved our stay except the hassle of entry into community. The scanner did not work all the time. Some times vehicles were backed up and lousy lady guard who cant seem to handle it all well. The team members were great very respectful, very helpful, everything was excellent!!! The home was extremely beautiful the furniture was very very clean brand new very stylish, the whole house exceeded my expectations. My whole family loved it we didnt wanna leave. The water park was magnificent!